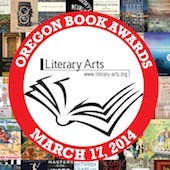 Purchase tickets to the 2014 Oregon Book Awards Ceremony here! Join Literary Arts’ annual celebration of the state’s most accomplished writers in the genres of poetry, fiction, nonfiction, young readers, and graphic literature. Winners will be named at the Oregon Book Awards Ceremony at the Gerding Theater at the Armory in Portland. Award-winning author Luís Alberto Urrea will host the ceremony. Luis Alberto Urrea is a critically acclaimed and best-selling author of 13 books. He has won numerous awards for his poetry, fiction and essays. The Devil’s Highway, his 2004 non-fiction account of a group of Mexican immigrants lost in the Arizona desert, won the Lannan Literary Award and was a finalist for the Pulitzer Prize and the Pacific Rim Kiriyama Prize. $10 – Upper Balcony-level seating to the Oregon Book Awards Ceremony. $17 – Orchestra-level seating to the Oregon Book Awards Ceremony. $50 – Patron ticket to the Oregon Book Awards Ceremony. This price includes premium seating at the Gerding Theater and a contribution to the Oregon Book Awards & Fellowships program. We recommend you have tickets mailed to you in order to avoid long lines at will-call.